Dave Zeitlin is the RTC correspondent for the Ivy League and a featured columnist. Click here for all of our 2009-10 Season Preview materials..
What You Need to Know. Fueled by three star seniors (Louis Dale, Ryan Wittman and Jeff Foote), the reigning Ivy League rookie of the year (Chris Wrobleski), and two major transfers (Mark Coury from Kentucky and Max Groebe from UMass), Cornell is coming into the 2009-10 season as the heavy favorite to capture its third straight conference crown — and perhaps win a game or two in the NCAA tournament. Head coach Steve Donahue’s squad is so deep and talented (they also boast a pair of experienced seniors in Geoff Reeves and Alex Tyler), their toughest challenge may be finding significant minutes for all their heavy hitters. Penn and Princeton, the powerhouses that owned the Ivy League for two decades until Cornell rose to the top, are both trying to return to their glory days but might have to wait a year to make a serious run at the crown. Princeton should improve on its 8-6 league mark with the continued development of point guard Doug Davis, who averaged 12.3 points per game as a rookie last season, and the addition of Ian Hummer, who may be the best freshman in the league. This is an important year for rebuilding Penn, which clears out some mediocre seniors and hands the keys of the team to junior guard Tyler Benardini and sophomore point guard Zack Rosen, the last two Big 5 rookies of the year. Columbia has some nice incoming talent with Brian Grimes, who sat out last season with an ACL tear after transferring in from La Salle, and Loyola Marymount import Max Craig, who is 7 feet tall and not a stiff. Harvard coach Tommy Amaker has one of the best players in the league in Jeremy Lin and a couple of good recent recruiting classes, but the Crimson are coming off a 6-8 conference season. Yale has been a consistent threat under longtime coach James Jones, finishing above .500 for nine straight seasons. The Bulldogs will need to put a lot of the burden on senior guard Alex Zampier (13.2 ppg) to keep that streak alive. Matt Mullery shot a ridiculous 60 percent for Brown last year, but the Bears will be hard-pressed to significantly improve their 3-11 league record. And finally, after an impressive 7-7 Ivy season by its standards, Dartmouth should tumble back down the league standings with the loss of Alex Barnett and his 19.4 points per game. David Zeitlin is the RTC correspondent for the Ivy League. Let’s see … what to report from the Ivy League from the last two weeks. Hmm. Cornell beat a team by 54 points. That’s fun – even though they did it to Division III Ursinus. What else? What else? Oh! Yale and Columbia both added to the New Jersey Institute of Technology’s record 50-game Division I losing streak. Good for them. And … I think that’s about– oh wait, I almost forgot! Harvard had probably its greatest win in school history while providing the Ivy League with its best moment in quite some time. That’s probably the big story of the week, right? When Harvard (9-6) pulled off that shocker over Boston College last week, however, it seemed like there were two overriding sentiments: One was that since B.C. had just beaten then-No. 1 North Carolina, then Harvard should be the new No. 1 team in the land. And two, how ’bout that Tommy Amaker, huh? 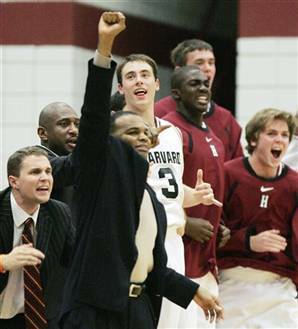 While I agree that Harvard is the best team there ever was or ever will be, I am hesitant to heap all of the praise entirely on Amaker. Instead, I would like to take a moment to praise former coach Frank Sullivan, a very good man who had little success at Harvard but whose lasting legacy might be leaving the program with Jeremy Lin. Granted, Amaker has brought in a very talented freshmen class, and has probably instilled a newfound belief into his players, but Lin is simply playing at another level right now. Against Boston College, the junior guard scored a game-high 27 points while dishing out eight assists. Here are some highlights of Lin schooling the Eagles. Despite a recent 71-54 loss to Minnesota in which it shot 17 percent in the second half, Cornell remains clear front-runners in the Ivy League. The Big Red are only 4-5 but they’ve had a brutal non-conference schedule with their last eight games coming on the road. Needless to say, they’re excited to come home, which actually is saying something because not many people are excited to go to Ithaca in December. With reigning Ivy League Player of the Year Louis Dale nearly back to full strength, Cornell welcomes La Salle tomorrow – and La Salle coach Dr. John Giannini is concerned, calling the Red the “best team on our schedule with the possible exception of those Big East and ACC teams.” He’s a doctor, so you should listen. Well, a good portion of the non-conference slate is over, and the Ivy League still doesn’t have a big signature win. But Cornell came pretty darn close to pulling off a huge early-season upset Wednesday when it led Syracuse at halftime and took the Orange right down to the wire at the Carrier Dome. Naturally, Syracuse players said it was a lazy effort on their parts while Cornell coach Steve Donahue praised his team’s effort. Fine, we get it. The only way an Ivy League team can even stay with a Big East team is by playing smart and outhustling the other team (backdoor cuts don’t hurt either). But the truth is, the defending Ivy champs have a very good team that may have a chance to make some national noise down the road. (Keep in mind, the Big Red played against ‘Cuse without their two best guards, Louis Dale and Adam Gore.